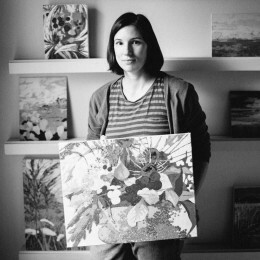 Jessica Fields paints landscapes. Even when she’s not really painting a landscape, it’s probably kind of a landscape. There’s this great bit in Travels with Charlie where Steinbeck talks about Texans, and how any Texan who makes any money immediately buys a ranch. (ahem, G.W.) They are bound to the land. Jessica Fields is from Texas. She will never have the money to buy a ranch but she will paint them. And she will paint the rivers and hills and mountains of her new Carolina home too. And the flowers that come from the land and the people who live on it. If you squint your eyes… there is a beautiful sameness. Her works trade in color and texture. Thick, buttery paint in saturated hues adorn each canvas, attempting to convey the weightyness of both the earth and the air. She forgot how to paint with a brush some time ago and now wields a number of knives and trowels. The wax infused paint creates a chunky consistency, like jam. All to add a sense of the physical to the abstract. To put action and effort to thoughts. To catch and ground those brief moments of transcendence.